“I have known Davis for almost two decades, and have seen time and again the reach of his intellect and imagination. One manifestation is his almost unparalleled mastery of the writings and literature of quality improvement. 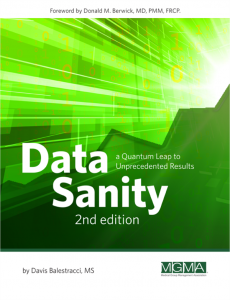 Are you a candidate for Data Sanity? Frustrated by glacial improvement progress. Tired of being promised easy answers through yet another training program (usually in quality tools). Ready to hardwire an improvement mindset into your everyday organizational fabric. Looking for realistic, practical answers that may not initially seem easy, but will address deep causes, get your desired results and hold these gains. Listen to Davis’s free 10-minute podcast on DATA SANITY & Emotional Intelligence.